From the 14th to the 17th of January in Geneva, the heart of the Horological world, we received our first glimpses of watches to look forward to this year at the Salon International de la Haute Horlogerie (SIHH), one of the Horologist’s most prestigious fairs, alongside Baselworld. SIHH is one of the most exclusive watch fairs which was founded in 1991 by the Richemont Group, who are the owners of the luxury brands: Cartier, Panerai and Jaeger LeCoultre. At this invite-only event the newest innovations in the horology world are on display, showing what is to come for the following twelve months. This year at the Salon International de la Haute Horlogerie, common themes that we observed included a rise in the use of the Perpetual calendar and many watch brands presenting new creations in blue colour themes. 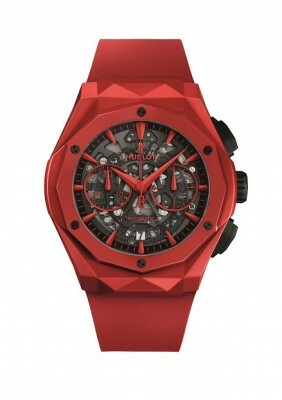 There were also other watch brands including Hublot, who still presented new releases in more a variety of colours. Another notable trend for 2019 is the use of skeletal dials. See our collection of luxury & designer watches here. 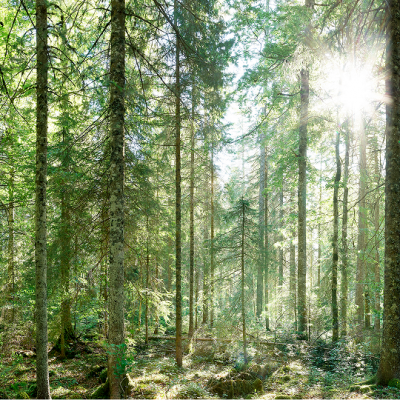 Jaeger LeCoultre was founded in 1833 and operates in the Vallée de Joux; This year they brought the elements of the forests from the Vallée de Joux to the SIHH exhibition hall for all to experience the some of the magic which is behind the inspiration of their watches. 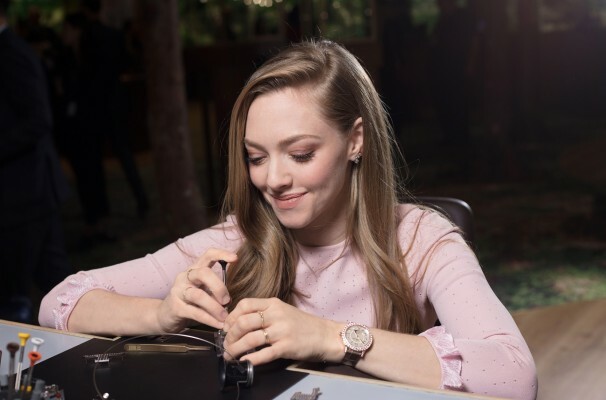 For the unveiling of their new watches, Jaeger LeCoultre hosted their current brand ambassadors Amanda Seyfried, Nicholas Hoult and Daniel Bruehl. 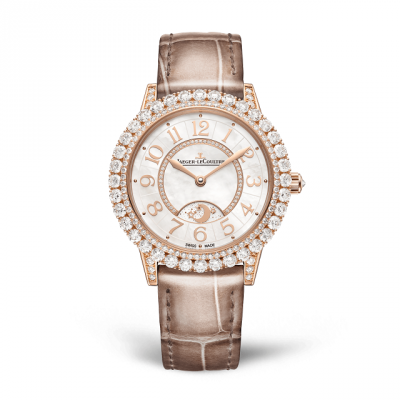 See our collection of Jaeger LeCoultre watches here. Amanda Seyfried can be seen wearing the new Rendez-Vous Night & Day Jewellery watch which is available in both pink and white gold. Amanda is wearing the stunning pink gold version in the photo above and below we have an up close photo to show the intricacies of the watch. It is a fine example of the skill that goes into making a Jaeger LeCoultre watch, with the adornment of the bezel alone taking 11 hours to be set in their Griffes Setting ( a technique they developed from Jaeger LeCoultre’s 101 watches). The Master Grande Tradition Gyrotourbillon Westminster Perpétuel (pictured below) is the newest multi-axis tourbillon from Jaeger LeCoultre. Released at SIHH this year, this exceptional timepiece is an example of watchmaking at its very finest. In comparison with its’ predecessors, this Gyrotourbillon features a significantly smaller tourbillon, which also reduces the error tolerance, making it a highly valued and complex timepiece. This watch contains four sets of gongs and hammers that work to create the Westminster chime to indicate the quarters when the minute repeater is activated. With one of the most complicated calibres Jaeger LeCoultre has ever created, there have been 18 numbered pieces of this model made, no more. A true collectors item. Hublot is one of the younger Swiss watch brands on the market, yet this does not make them any less desirable, being among one of the most sought after watch brands by both women and men over the last number of years. Hublot watches were founded in 1980. As an innovative and modern watch brand, they set themselves apart from others at the time and broke with traditions by creating the first gold watch with a natural rubber strap. “The Art of fusion” motto has been a feature of the Hublot brand identity since it was founded – a philosophy which has helped them bring many new materials to life through their watchmaking. Unveiled at SIHH 2019, this Classic Fusion chronograph watch designed by Richard Orlinski has been combined with Hublot’s patented red ceramic for the first time. Orlinski is a world-renowned contemporary artist known for his sharp three dimensional sculpted lines which he has brought brilliantly to this watch design. 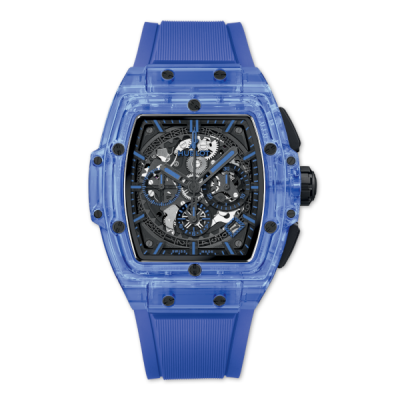 This partnership between Orlinski and Hublot has resulted in a limited edition of 200 watches being made in this model and colour. The red colour has significance for Orlinski who associates the colour with life and passion, a colour which he used to create his first Born Wild Crocodile sculpture. See our collection of Hublot Watches here. 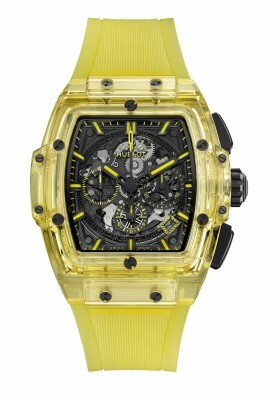 Hublot brought some exquisite watches to the exhibition this year like this Yellow Sapphire Spirit of Big Bang watch. 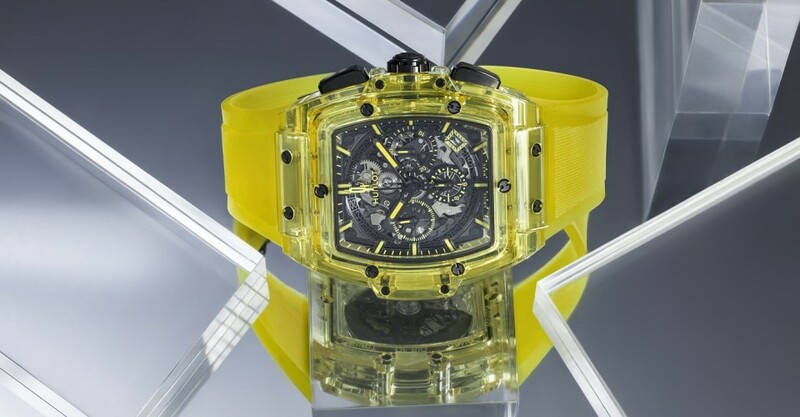 This unique 42mm watch is a limited edition with the bezel and case made of polished yellow sapphire crystal. It is one of two variations of the watch which was also released in blue sapphire , a trend that was broadly seen across the brands of the fair this year. There are only going to be 100 of each watch made making it an impressive collectors watch. It features 278 components and has a battery reserve of 50 hours. Tag Heuer unveiled its newest, exciting innovation at the exhibition in Geneva this year. A brand new development, TAG heuer is the first to create a hairspring made of a carbon composite. 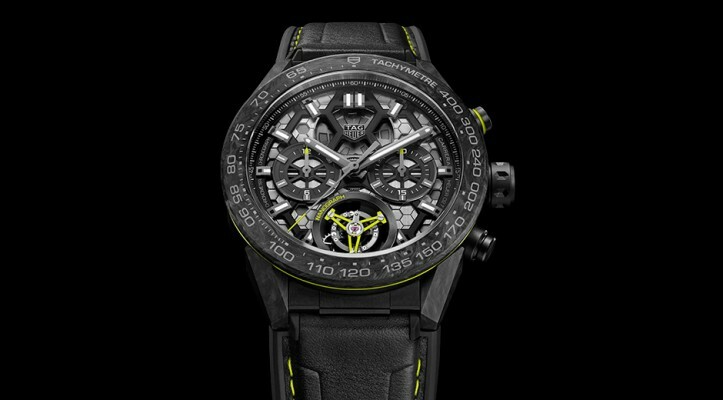 The new innovation has been used in their new Carrera Calibre Heuer 02T Tourbillon Nanograph which regulates the watch. The hexagonal design on the dial of the new Carrera Calibre Heuer 02T is a reference to the composition of the molecular structure of carbon. The most distinguishing feature on this new Carrera chronometer certified chronograph is its multilayer dial and movement combination, featuring hexagons on the movement plate that are visible through an open worked dial. Tag Heuer is exclusively producing these new hairsprings as they are designed and produced in their in-house laboratory in La Chaux de Fonds. Benefits of this newly developed hairspring mean that the hairspring is very lightweight and virtually unaffected by gravity or shock whereas other watches with a metal hairspring were found to have their hairsprings bent on endurance tests when the watches were dropped from 1m. After seeing the unveiling of such a vast and impressive collection of women’s and men’s watches from SIHH 2019 this only increases our excitement of what will come out of Switzerland next. With Baselworld just around the corner we will be waiting in anticipation to see what the likes of Rolex, Patek Philippe and many more will have in store for us this year.